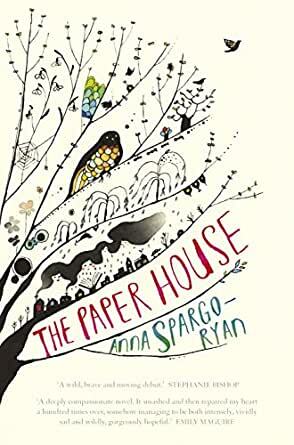 Anna Spargo-Ryan's astonishing debut: the stylistically brilliant, fearless and heartbreaking story of a woman grieving the death of her child. I have mixed feelings about this book. The writing is really beautiful and the writer obviously has a real gift for imagery and creating scenes. However, I also found it quite difficult and slow reading and found there were sections of the book that I really didn't understand. Given much of the subject matter centres around mental health, perhaps this is deliberate and supposed to make the reader question things, but for me personally it was pretty heavy going. I didn't really connect with the characters until almost the end of the book, but found the end satisfying and I'm glad I persevered. The Paper House is a stunning, heart-shattering read. Full of prose like: "And over the top of the house, the morning sun came like glancing lightning, the suggestion of daylight," Anna Spargo-Ryan weaves poetry and story together to create a book full of bittersweet whimsy, sadness and ultimately, love. Told through the lens of a character experiencing an acute mental health episode, the reader is taken on a dream-like journey throughout which sharp, clear, empathetic moments are experienced. Chapter one is a masterpiece, perfectly setting the stage for the almost-too-real story to come. I devoured this book in a matter of hours, unable to put it down. Highly recommended for anyone who delights in beautiful language without sacrificing depth or meaning. It took a little while to get used to the way the author uses language, but gradually it pulled me into the world the author was creating. The parallel stories of the narrator, living with the still birth of her baby and the remembered story of her mother living with mental illness are neatly woven together. And although it is a first person narrative Anna Spargo-Ryan still manages to vividly evoke the other characters who form a loving and supportive community around Heather. And this is the joy of the book; this group of real characters, working through their own issues but still finding ways to enjoy life and each others company,. 4.0 out of 5 starsIt really is that good! An exploration of how we humans, in our privileged lives, are so poorly equipped to deal with the ravines that open in our lives. I really loved the way this book was written, such vivid descriptions and characters. The dreamlike state it invokes is fantastic.